A derailed train in Mount Carbon, WVa. 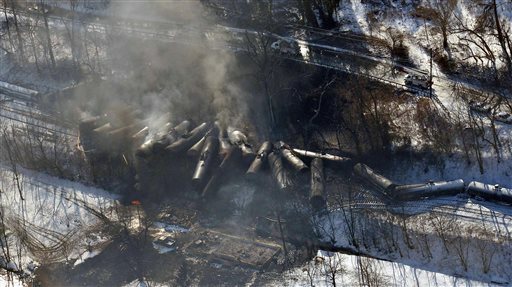 The federal government predicts that trains hauling crude oil or ethanol will derail an average of 10 times a year over the next two decades, causing more than $4 billion in damage and possibly killing hundreds of people if an accident happens in a densely populated part of the U.S.
At least nine of the trains, including the CSX train that derailed in West Virginia, were hauling oil from the Northern Plains’ Bakken region that is known for being highly volatile. Of those, seven resulted in fires.